Let my base jump adventure convince you to give it a go. You don’t even have to jump. It’s not like you actually have to jump up and then plummet down. You just have to look straight ahead into the horizon and take a step forward. 2. You can do it the easy way. Some people jump off mountains and buildings and land with a parachute, but that is not the only way. I used a base jumping simulator. It is kind of the same. It gives all the thrill of jumping without the hassle of releasing a parachute. Instead you’re attached to a wire which slows your fall after 80 per cent of the drop. 3. The reason you’re terrified is totally natural. Your brain will tell you not to do it. That’s it’s job. It is supposed to protect you from potentially harmful things. What your brain doesn’t know is that it is safe and you won’t die. Keep telling yourself it’s safe. Take your time, mabybe watch other people jump first and go then for it. I think I stood on the ledge of the building for 20 minutes before something inside me clicked and I leaped off. I didn’t count to three or consciously do it. I kind of unthinkingly/spontaneously did it in the same way you might get out of bed on a cold morning. 4. Your perception will be all messed up. Everything looks scary from 100 feet above ground. Below, 140 feet down, I could see the twinkling lights that highlighted the landing platform and beyond that there was wasteland. Skips, metal poles and overgrowth, from the building next door were strewn on the ground and from the angle I was looking it looked as if I would land in a skip or skewer myself on a pole. 5. There are bigger things to be afraid of. It’s never going to be as safe as sitting at home, but after of lifetime of sitting at home and not really living your life, the scary thing will be having regret and not being able to do anything about it. 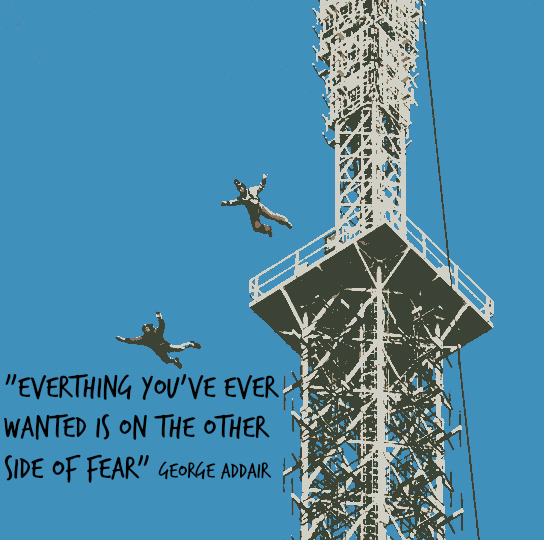 I was first in line of six base jumpers – none of whom, I might add, were rushing to go first. I wanted to change my mind but I couldn’t go back because I didn’t want to look back on this moment in my life and feel annoyed at myself for no going for it. I had enough regrets already. Also, if I went back I would have had to climb down two ladders and I hate climbing ladders. Choosing between climbing down the ladders or jumping was easy. I jumped. 6. It is as scary as you think it is but that’s the whole point! Do it to face your fears and boost your confidence because every great thing you desire in life lies on the other side of fear. I was pretty sure my screams could be heard across Bedfordshire. I fell with my mouth gaping open and my eyes wide with fear but then the wire set in and slowed me down so I landed gently on the platform. 7. You get a lot of love afterwards! You won’t be alone. There will be people at both ends to offer you support. And which group would you rather be in, the group getting a slap on the back for going through with it or the group that everyone looks at with pity because fear held them back?. I was shaking and giggling nervously. Martin came over and held me by my shoulders, looked me in the eyes and told me I was safe. I started whooping and hugging anyone who came near me. 8. There’s no drug like it on the planet. You are going to feel on top of the world once your feet are firmly on the ground. I was super high on adrenaline – I felt sharper, more confident, more articulate and pretty invincible – right into the evening. I slept like a baby and woke the next morning feeling like a million dollars. 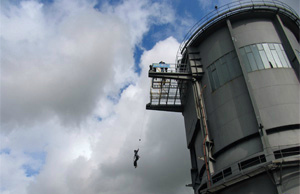 Posted in Crazy, EnglandTagged base jump, Bedford, bodyflight, England, extreme sports, overcome fearBookmark the permalink.